Blackberry Bold 9900 & Blackberry Torch 9810 Price in Malaysia Revealed!!! This week has been about berries and tablets. The price for Blackberry Bold 9900 is RM2,188 and Blackberry Torch 9810 is RM1,988 as seen in Brightstar, an authorised distributor of Blackberry. 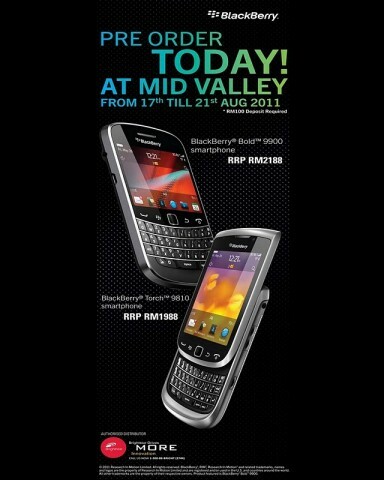 You can pre-book your desired Blackberry with a RM300 deposit during their roadshow in Mid Valley. Their roadshow starts on 17th August 2011 (Wednesday) until 21st August 2011 (Sunday). The official launching of both Blackberry model is set on 15th September 2011. You can get it without contract at authorised dealers or you can get it with contract with Maxis, DiGi and Celcom. Maxis RIM Blackberry Playbook Bundle Plans Revealed! HTC Evo 3D Price in Malaysia – RM2,199 & ROI is Open Already! Next story 2nd CSL 3S Care Center & Northern Hub Launching in Penang together with 4 models of Swarovski CSL Phones!! !